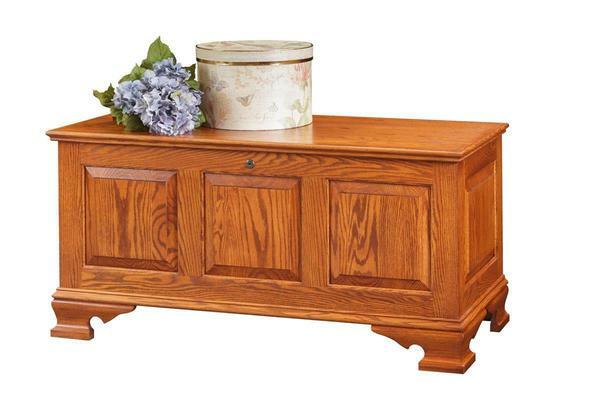 This beautiful Medium Classic Panel Hope Chest with Cedar Bottom is handcrafted of solid wood. Please call to speak to one of our Amish furniture specialists with questions on this oak wood chest or ordering assistance. If you select to have a Brass Plaque, expect a call within 24 hours to receive your engraving message. This plaque will be mounted on the inside of the lid unless otherwise specified. Brass Plate Engraving 1 3/4" x 4"
*Brass plate will be located under the lid unless otherwise noted. Please make any location changes clear in the notes of your order. *Brass metallic plate has laser engraving and the font is black.